The epidermal growth factor receptor (EGFR) is a receptor tyrosine kinase (RTK) with pleiotropic developmental functions in metazoans. It is the prototypical member of the ErbB family of RTKs, which can form homodimers or heterodimers with other ErbB family members upon ligation with a variety of EGF-related extracellular ligands to facilitate transphosphorylation and downstream signaling. EGFR, as well as other ErbB family members and their cognate ligands, is dysregulated during the development of a substantial fraction of solid tumors, most notably cancers of the breast and lung. The selective ATP-competitive tyrosine kinase inhibitors (TKIs), gefitinib and erlotinib, which target the EGFR kinase domain, have been introduced in the clinic as a treatment for chemotherapy-refractory non-small cell lung cancer (NSCLC). Initial trials of these compounds revealed a narrow efficacy profile in NSCLC patients, with approximately 10% of patients experiencing significant clinical response. It was later found that the vast majority of these responsive patients exhibited somatic activating mutations within the kinase domain of EGFR. 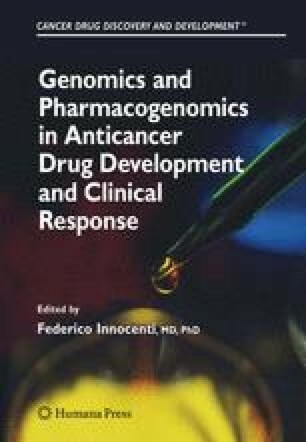 This chapter outlines recent insights into the biochemical and signaling properties of mutant EGFR proteins, as well as the molecular basis for the sensitivity of tumors harboring these mutants to gefitinib and erlotinib. The challenges associated with primary and acquired resistance to EGFR TKIs in NSCLC are also discussed. Finally, alternative strategies to target the activities of EGFR and other ErbB proteins in lung cancer are described.